This is one of those dishes that tastes like some effort was put in, but it’s actually easy enough to make without gnawing your arm off when you’re starving after a long day at work. 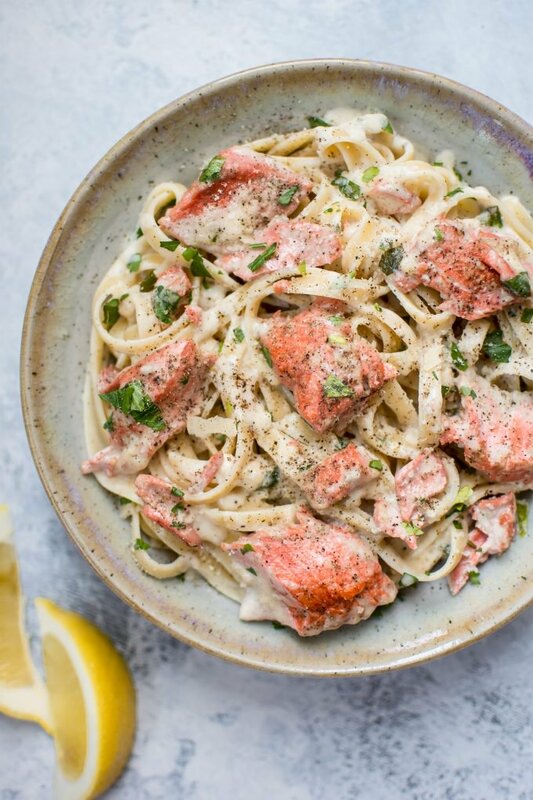 This creamy garlic salmon pasta dish is a good option for a date night in, or you can easily double (or triple) the recipe if you have guests to feed without adding a lot of extra work. I used fettuccine, but feel free to use your favorite pasta or whatever’s in the cupboard. Tips : The sauce is fairly lemony, so if you’re on the fence about how much to add, halve the amount of lemon. You can then always squeeze more in when you’ve given it a taste if you think it needs more. Boil a large salted pot of water for your pasta. Cook using package directions until it's al dente. Grate parmesan and set aside. Season the salmon lightly with onion powder and salt & pepper on both sides. Add the olive oil and butter to a skillet on medium high heat. Once it's hot, add the salmon. Cook salmon for a couple of minutes on each side. Take the salmon out of the pan and set aside. Add the white wine, lemon juice, cream, garlic, and parmesan, and scrape the bottom of the pan so the brown bits get incorporated into the sauce. Slowly add the flour to the sauce, while stirring, to avoid any lumps. Add the salmon back in the pan and break it up with your cooking spoon so it's in bite-size chunks. Gently mix it in with the sauce. Cook for an additional five minutes or so until the sauce is thickened and salmon is cooked through. Drain pasta and add it to the skillet, along with 1 tablespoon of the water you cooked the pasta in. Gently mix the sauce and pasta. Serve immediately with parsley and extra parmesan cheese if desired. *If you can't buy skinless salmon, you can easily remove the salmon from the skin just before you add the salmon back into the pan (step 6), or use a sharp knife to remove the skin prior to seasoning it. Or keep it on if you don't mind it. This recipe is easily doubled. I used one piece of fish when making this recipe for two people. The sauce is fairly lemony, so if you're not into that, halve the amount of lemon, then add more in once you've tasted it if it's not lemony enough for you. 0 Response to "Salmon Pasta with a Creamy Garlic Sauce"